Blueboat Hostel Nampo branch is located 3 minutes away from Nampo subway station and famous 'Gwangbok Road'. And our property is consist of twin, 2 dorm., 4 dorm., 6 dorm. and 8 dorm. room type. It will be adopted to variety groups. 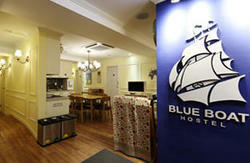 If you looking for comfortable hostel with the first-class service and reasonable price, Blueboat will be the answer. It is adjoined to Nampo-dong and Youngdusan Park. It is also situated near subway and bus station, making easy access to the places where the lively city has to offer. Offering various room types with reasonable price, Blueboat Hostel is an ideal place for both leisure and business travelers. Appointed to the highest level of cozy and comfort, all the well-decorated rooms feature superior amenities. After check in, clients can enjoy the use of PC, iron and toiletries. The simple breakfast available will give guests a good start from the morning. Come and enjoy your trip to Busan. The staff here will put all of their effort into satisfying every single of your needs. Take the subway at Busan subway station direction to 'Sinpyeong'.-> Get off at the Nampodong station.-> Use No.7 exit, And go straight (3 o`clock direction) into the alley next to the camera shop at 7th, Nampo subway station->Go straight until 'Woori bank' and turn left into the alley between the GS25 convenience store. -> Go straight 20m and you can find 'Blue Boat Hostel' at your right side. 4th floor, sir. Take the subway at Airport subway station direction to 'Sa-sang'.-> At Sa-sang, Transfer to Seomyeon direction, which is line No.2(green line)-> At Seomyeon, Transfer to 'Sinpyeong' direction, which is line No.1(red line) -> Get off at the Nampodong station.-> Use No.7 exit, And go straight (3 o`clock direction) into the alley next to the camera shop at 7th, Nampo subway station->Go straight until 'Woori bank' and turn left into the alley between the GS25 convenience store. -> Go straight 20m and you can find 'Blue Boat Hostel' at your right side. 4th floor, sir. Take the subway at Nopo subway station direction to 'Sinpyeong'.-> Get off at the Nampodong station.-> Use No.7 exit, And go straight (3 o`clock direction) into the alley next to the camera shop at 7th, Nampo subway station->Go straight until 'Woori bank' and turn left into the alley between the GS25 convenience store. -> Go straight 20m and you can find 'Blue Boat Hostel' at your right side. 4th floor, sir. Take the subway at Sa-sang subway station direction to Seomyeon'.-> At Seomyeon, Transfer to 'Sinpyeong' direction, which is line No.1(red line) -> Get off at the Nampodong station.-> Use No.7 exit, And go straight (3 o`clock direction) into the alley next to the camera shop at 7th, Nampo subway station->Go straight until 'Woori bank' and turn left into the alley between the GS25 convenience store. -> Go straight 20m and you can find 'Blue Boat Hostel' at your right side. 4th floor, sir. Across the street from Busan train station-> Take bus No.61, No.71 or No.88B -> Get off at 'Busan De-pa-t' station' -> Go staright to LOTTE Department store-> Turn right at GS25 convenience store-> Go straight 50m and you can find 'Blue Boat Hostel' at your right side. 4th floor, sir. Take airport limousine bus direction to Seomyeon/Busan Train station/Nampo-dong at airport-> Get off at Nampo-dong-> Go to Nampo subway exit No.7->At No.7 exit, go straight (3 o`clock direction) into the alley next to the camera shop at 7th, Nampo subway station->Go straight until 'Woori bank' and turn left into the alley between the GS25 convenience store. -> Go straight 20m and you can find 'Blue Boat Hostel' at your right side. 4th floor, sir.